Middlesex Middle School Principal Shelley Semmers speaking before the Board of Education at their meeting Tuesday night. Taken Jan. 22. 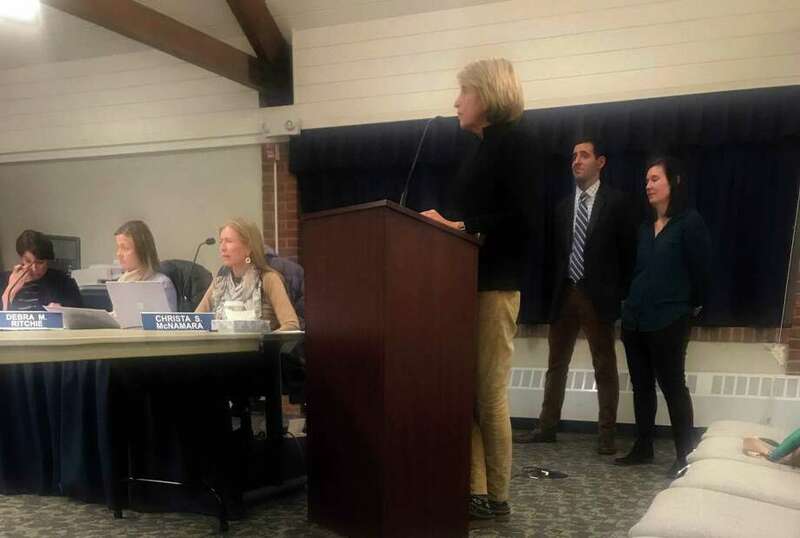 DARIEN — As budget meetings continue, Middlesex Middle School officials presented their case for what they see as an invaluable asset — one more guidance counselor. Interim Superintendent Elliott Landon recently called for another counselor position in the 2019-20 schools budget, and Middlesex Principal Shelley Sommers told the Board of Education at its Tuesday meeting the addition would be beneficial for students. “I have a vision of a program in which we can expand the meetings that we have with our teams about students concerns, so we can provide early intervention for our students as the needs arise,” Sommers said. currently 1,136 students between sixth and eighth grades at Middlesex. Landon said an additional counselor would enable a closer connection between counselors and students. “It will enable us to have counselors stay with students throughout three years in Middlesex,” he said. Anthony Pavia, a seventh- and eighth-grade counselor, said while he and his fellow counselors get the job done, it’s not as effective and efficient as it could be. Pavia recalled last week he had several meetings with students and parents to attend at once. Rachel Sandler, an eighth-grade counselor, said she couldn’t imagine how her co-workers split grades. Counselors split between grades have to prioritize between student and parent meetings in different grade levels, and then have to circle back to meetings they missed, she said. No formal decision was made as the board continues to work through the budget process. Board Vice-Chair Mike Dineen said it is important the school continues to be proactive and also asked that schools think three to four years into the future. “It seems to me that we will be talking more about counselors, social workers and psychologists than we may be talking about the addition of teachers over the next couple of years,” Dineen said.